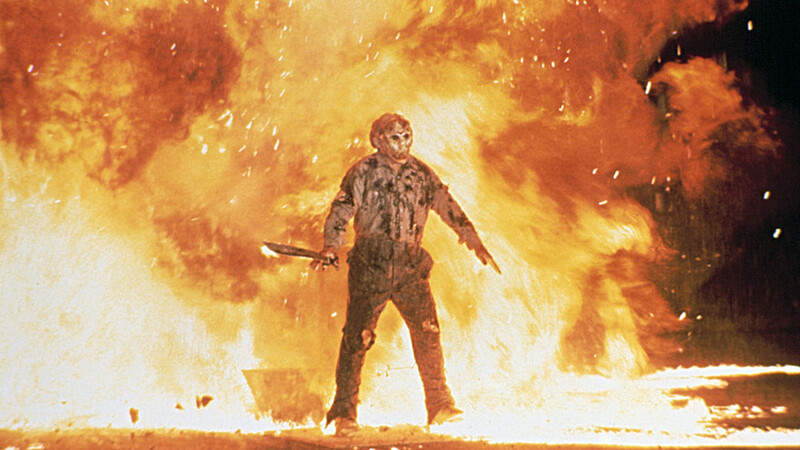 Even if you really want to buy stocks, you just might hold off on this Friday the 13th. It’s not that you’re superstitious. The problem is all those other people who fret about unlucky days. Those scaredy cats believe they’re in greater danger on days like today, so they become more anxious or distracted, and that ends up leading to actual trouble. “It becomes a self-fulfilling prophecy,” as one psychologist put it, to U.K. newspaper The Telegraph. So let’s talk about selling — something the world’s largest hedge-fund complex revealed it’s doing in a big way. That comes as the bears have taken over this week, knocking 254 points off the Dow yesterday and putting it on track to halt a six-week winning streak. 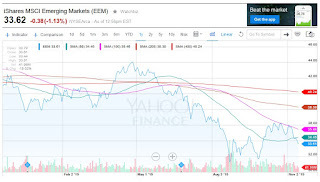 Ray Dalio’s Bridgewater Associates disclosed it’s been slashing emerging-markets stocks, taking a chainsaw to its stakes in the Vanguard FTSE Emerging Markets ETF (VWO) and the iShares MSCI Emerging Markets ETF (EEM) during the third quarter. More on that in the call of the day. And note that a much-anticipated reading on retail sales “could spook stocks on Friday the 13th,” as CNBC puts it. That figure, which missed forecasts, is part of a bunch of data hitting today. 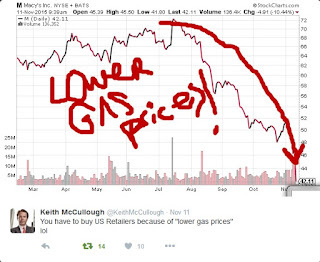 But for a little talk about buying, read on to the chart of the day. It sheds light on Corporate America’s stock-buyback spree, arguing it’s been unfairly vilified. 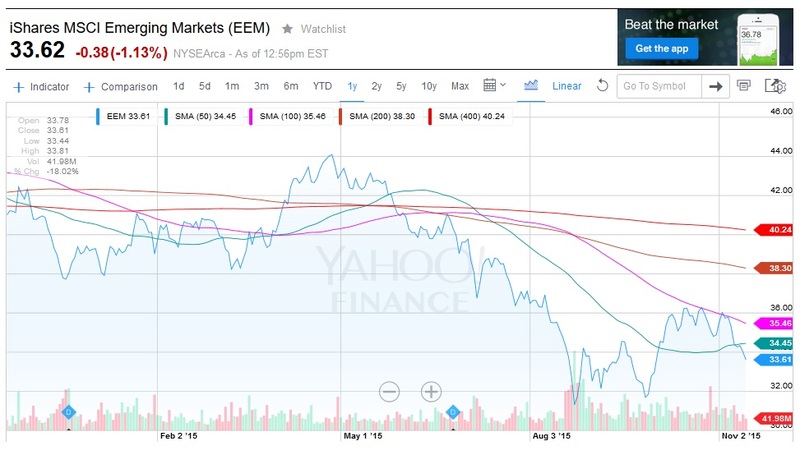 Sell emerging markets stocks. That was the cry at Dalio’s Bridgewater Associates, at least for the third quarter. The giant hedge-fund complex slashed its holdings in two big U.S.-listed emerging markets ETFs — VWO and EEM — by about 40% during the third quarter, as noted by a Barron’s blog post that cites a 13F filing. That helped drive a 31% decline in Bridgewater’s U.S. public equity holdings. But how’s Dalio actually doing this year? Well, his All Weather Fund was up 4.1% in October, but still down 3.4% for the year, according to a Reuters report this week. His Pure Alpha II Fund was up 3.3% in October, for a year-to-date total return of 7.4%. And the Bridgewater boss wasn’t just selling in Q3, with a GuruFocus report saying he went on a “diversification tear” and bought individual stocks such as Ralph Lauren (RL), FedEx (FDX), AT&T (T) and Oracle (ORCL). “Remember when everybody was talking about the impact that ‘risk-parity’ investment strategies were having [on] markets?” Barron’s adds. Risk-parity pioneer Dalio pushed back against that criticism in September. 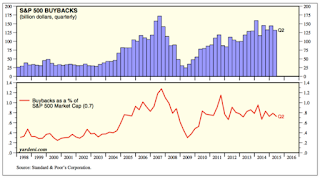 Buybacks are “widely vilified” and “greatly misunderstood,” argues Urban Carmel in a post over at The Fat Pitch blog. “It’s true that corporations buying their own shares (buybacks) represents a large source of demand for equities and have helped push asset prices higher. But much of what is believed about buybacks is a myth,” the post says. “While the dollar amounts of buybacks are large,” they are “small relative to the size of the stock market,” Carmel writes. Go here to read the whole thing. I'd love to see that buyback data broken down by individual companies so we can gauge buybacks of say an Apple (AAPL) relative to Apple's market cap and so on. As I argued back in March, there's no buyback or biotech bubble but there's also no doubt in my mind that companies are using buybacks to pad the bloated compensation of their top brass (of course, they will claim it's to reward shareholders). Anyways, it's Friday the 13th, and everyone including those short-selling gold bugs on Zero Hedge is making a huge deal of Bridgewater's latest move to dump some its equity holdings in the third quarter. So what spooked Ray Dalio in Q3? He's on record that he's worried about the next downturn but I think he was more spooked by his fund's not so great performance prior to October where he made back some of his losses. I think Mr. Dalio realizes there's no end to the deflation supercycle and those betting big on a global recovery are not feeling any love from these schizoid markets. The same goes for cyclical sectors which are tied to the global recovery. 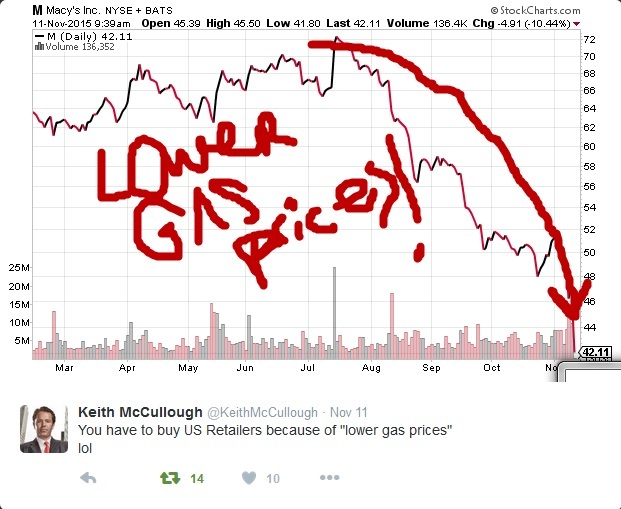 This is why I've repeatedly warned you to use countertrend rallies in energy (XLE), oil services (OIH) and metal and mining stocks (XME) as a means of unloading shares or shorting these sectors. And given Friday's weak retail sales, it's clear that U.S. consumers aren't in the mood to shop till they drop this season which is why the SPDR S&P Retail ETF (XRT) is making new 52-week lows. What are my thoughts? I think gross inequality is coming home to roost. In a debt deflation world where the top 1% are making off like bandits and the bottom 99% are struggling to get by, it's going to be difficult to see any significant pickup in retail sales. This is why I completely disagree with those smart folks at Goldman who are now claiming the bond market has it all wrong, underestimating U.S. inflation. Really? I think the bond market has had it right all along and it's the good folks at Goldman who have it wrong. Without strong growth in the U.S. and rest of word, inflation pressures will remain subdued for a very long time. The global economy risks protracted "sub-par growth," the International Monetary Fund (IMF) warned on Thursday, as economists continue slicing their forecasts. "With global economic prospects repeatedly marked down over the last five years, there is a concrete risk of a world economy persistently mired in sub-par growth, with unacceptably high levels of poverty and unemployment," the IMF said in a report out ahead of the G-20 leaders' summit in Turkey on Sunday. Real gross domestic product (GDP) growth is seen averaging 3.1 percent year-on-year across the globe in 2015 and 3.6 percent next year by the IMF. This is down from the international body's July forecasts, which suggested economic expansion of 3.3 percent in 2015 and 3.8 percent in 2016. It is also marginally slower than the growth rates of 3.3 percent and 3.4 percent seen in 2013 and 2014, respectively. "Growth remains fragile and could be derailed if transitions are not successfully navigated. In an environment of declining commodity prices, reduced capital flows to emerging markets, and higher financial market volatility, downside risks to the outlook remain elevated, particularly for emerging economies," the IMF said. The three biggest risks to the global economy were seen as the upcoming normalization of monetary policy by the U.S. Federal Reserve, the slump in commodity prices and the slowdown in China. China's economy has steadily slowed since 2010 and is seen continuing to do so, with economic growth forecast at 6.8 percent in 2015 and 6.3 percent in 2016. "China's rebalancing is generating large spillovers, and notwithstanding the Chinese economy's sizable buffers, could be disruptive abroad. Either a moderate slowdown or a harder landing over the medium term could produce sizable spillovers via slower global trade, a further weakening of commodity prices, and confidence effects," the IMF said. Overall, growth is seen declining in emerging economies for a fifth year in a row in 2015, before strengthening next year. Notably, Russia's economy is seen shrinking 3.8 percent this year and 0.6 percent next, while Brazil's economy is declining by 3.0 percent this year and 1.0 percent in 2016. Several international bodies and banks have issued anemic outlooks for global growth in recent weeks. On Thursday, UBS forecast that Latin American economies would shrink by an average of 0.8 percent in 2015, marking the worst recession since the 2008 financial crisis and the greatest underperformance relative to the rest of the world in almost 30 years. It predicted the region's economy would continue shrinking in 2016, forecasting a contraction of 0.2 percent. "We perceive the risks to the region to be skewed almost exclusively to the downside. We would highlight two: one, the risk that China slows more than expected, putting further downward pressure on trade with the Asian giant and on commodity prices, and potentially reducing Chinese external financing to the region; and two, the risk that Latin America faces a corporate credit event, particularly in Brazil," UBS economists led by Rafael de la Fuente said in a report. On Monday, the Organisation for Economic Co-Operation (OECD) cut it global growth estimate to 2.9 percent this year, down from a forecast of 3.0 percent made in September and 3.1 percent made in June. Plus, Moody's Investors Service warned this month that downside risks to the world economy had grown and that the proportion of countries awarded a "stable" credit outlook had fallen slightly from a year ago, while the share of "negative" outlooks had risen. On Thursday, Germany's Ifo Institute said its index tracking the world economy had "clouded over," reading 89.6 points for the fourth quarter – down from 95.9 in the third quarter and below the long-term average of 96.1. With such a weak global backdrop it's hard to see how the Federal Reserve will justify raising rates in December. In fact, if stocks keep sliding lower, I think it's safe to assume the Fed will stay put next month. This is the new normal folks, get used to seeing your daughters living at home longer as they pay off student debts and try to find a suitable partner who is (hopefully) gainfully employed and probably living at home too to pay off his crushing student loans. And they can forget about finding jobs with a decent pension. There will be no retiring in EU style for them, it's going to be work till they die, all part of America's pension justice. Larry Summers is right, topics like hysteresis, secular stagnation, and multiple equilibrium are getting more and more attention in a world that desperately needs a new macroeconomic paradigm but I'm afraid it's too little too late. There is something really ailing advanced economies and I don't see policymakers trying to tackle this deflationary disease with smart policies. But don't worry, as long as the prosperous few are able to buy their 7-year-old daughter a $77 million rare diamond, who cares about the restless many trying to start a family or just trying to put food on their table? Central banks might be busy saving the world but it's starting to scare a lot of people, especially those Swedes hiding cash in their microwaves because of a fascinating and terrifying new experiment. I know, I'm being my usual cynical self but it's Friday the 13th and even though markets aren't spooking me (far from it), the world is a lot more screwed up than we can possibly imagine. On that cheery note, I wish you all a nice weekend and remind you to kindly subscribe or donate at the top right-hand side of this blog to support my efforts. I thank those of you who have contributed and value the work that goes into this blog. Below, Teis Knuthsen, CIO at Saxo Private Bank, says monetary policy cannot be expected to raise inflation which is one reason the U.S. economy is closer to deflation than you think. Unlike Knuthsen, however, I see major supply and demand imbalances which all but ensure a protracted period of sub-par growth and more global deflation ahead. If that doesn't spook policymakers, big hedge funds and even bigger pension and sovereign wealth funds, I don't know what will.